Add to My Favorite Store. 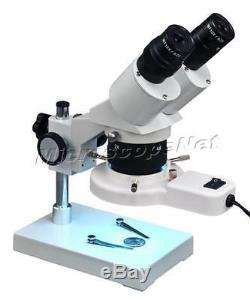 Binocular Stereo Microscope 20X-40X-80X with Fluorescent Ring Light. Wide field eyepieces WF10X/20 and WF20X. Plug and see, no special knowledge needed. High quality optical glass elements. Long working distance allows enough operation space. Diopter adjustment on ocular tube. Adjustable inter-pupillary distance to fit anyone's eyes. Product GS and CE approved. Eyepieces: wide field WF10X/20 and WF20X. Objective: rotatable 2X and 4X. Total magnification: 20x, 40x, 80x. Ocular tube diopter adjustment ±5dp. Interpupillary distance: 2-3/16" 2-15/16"(5575mm). Illumination: 8W fluorescent ring light. White/black plastic stage plate: 2-3/8 (60mm) in diameter. Power supply: 110V/60Hz (US and Canada). Dimension: 6-3/4" x 4-1/2" x 12 (17cm x 11.5cm x 31cm). Net weight: 4 lb 9 oz (2.065kg). Binocular stereo microscope with 2x and 4x objective. A pair of WF10X/20 eyepieces. A pair of WF20X eyepieces. 8W fluorescent ring light with tube. 1 extra ring light tube. 150W Gooseneck fiber cold light - Y type. 150W Cold ring light with fiber pipe. Q: How do I select a microscope that fits my needs? We would appreciate that once you receive your item, you also leave us feedback. If you feel that you cannot leave a Positive comment with all 5 stars - WE WILL EARN IT. We are here to exceed your expectations! The item "Binocular Stereo Fixed Power Microscope 20X-40X-80X + 8W Ring Light +Spare Bulb" is in sale since Tuesday, September 23, 2014. This item is in the category "Toys & Hobbies\Educational\Science & Nature\Insects & Bug Habitats".